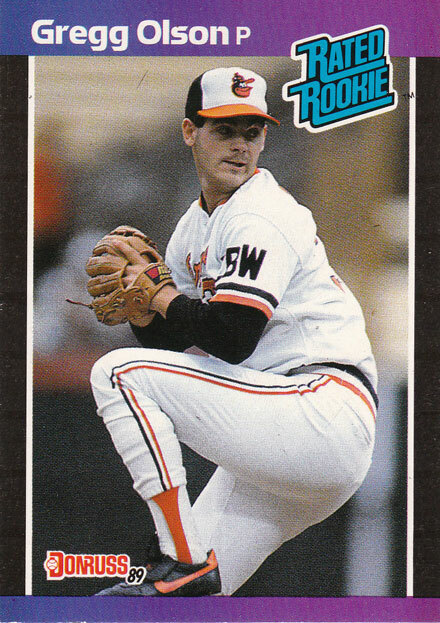 Which Orioles closer comes to mind when you think of blown saves? I’m not talking present tense. That’s easy. Rather, I’m talking about the guy who so made your stomach turn during his career that, fairly or not, you feel like grabbing the Maalox at the mere mention of his name. For me, that guy is Gregg Olson. Remember the disclaimer I offered in that earlier sentence, “fairly or not”? Well, it’s clearly not fair that Gregg Olson is my archetype for the blown save. Olson was a great closer. First reliever to be American League Rookie of the Year. An Orioles Hall of Famer (and Omaha Sports Hall of Famer for that matter), he is the team’s all-time saves leader. Olson saved 160 games in Baltimore and had a save percentage of 83 during five full seasons. The guy was so good he earned a nickname for himself (Otter) and his curveball (Uncle Charlie). The last time anyone had two nicknames for me it started with Tweedledee. Here’s what Tom Boswell wrote in The Washington Post after Olson blew a save against the Yankees on June 8, 1990. On Friday night at Memorial Stadium an amazing, stupifying and altogether almost unbelievable event transpired. The capacity crowd could only gasp in incredulity, too stunned to respond. Gregg Olson gave up a run. And he blew a save. Olson had not allowed a run here since July! And he’d permitted only one run-o-n-e r-u-n-in his previous 42 appearances, encompassing 61 innings since July 31. Of course, he knew he couldn’t flirt with perfection forever. “I knew that it couldn’t keep up, but I kept telling myself that it might,” said Olson. Clearly, my mind’s eye lacks 20-20 vision. The game I most remember from Olson’s career happened on June 19, 1991, one year after Boswell’s article. It’s not just that I attended that game with my family and saw the meltdown in person, although that’s part of it. I remember that game because Olson threw his uniform in the trash can afterward. Olson, pitching in relief of Jeff Robinson with a 4-3 lead surrender five runs – FIVE RUNS – to the Twins in an 8-4 loss. It was Turn Back the Clock Day in Baltimore honoring the 1966 team. When you’re a kid, and a guy blows a save on the day you went to the game, on the same day the team was wearing cool-looking uniforms, and you hear the pitcher literally tossed his uni in the trash … that’s not the kind of stuff you forget. Last week, on Opening Day in Baltimore, the Orioles honored the 1970 team. The O’s took a one-run lead into the ninth inning before the team’s closer blew the save. It was much the same set-up that years earlier created an unfair image of Gregg Olson in my mind. But as far as I know, Michael Gonzalez didn’t toss his uniform in the trash after the game.